AME to receive ComEd smart inventor rebate for its recent solar investment | Hennig Inc.
Rockford, Illinois, USA--02/26/2019--Advanced Machine & Engineering Co. (AME), a global manufacturer and distributor of precision machine tool components and metal cutting solutions, will be presented a rebate check from Commonwealth Edison Company (ComEd) as part of their smart inverter rebate program. The check presentation event will take place at 11:00 am (CST) on Friday, March 15, 2019 at the AME manufacturing facility. 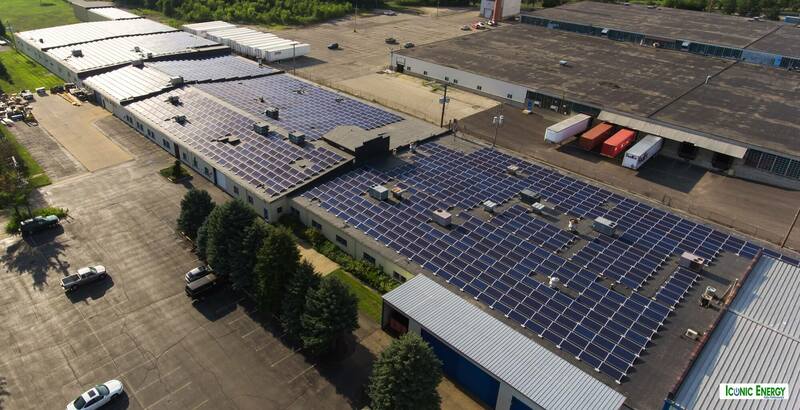 AME is the first company in the IL region to complete a large-scale smart inverter rebate application for its recent installment of 2,200 solar panels (704 KW solar array) on the roof of its manufacturing facility. The solar installation qualified AME for the Illinois Solar Investment Tax Credit (ITC) and the Solar Renewable Energy Credit (SRECs). Collectively, these incentives covered 70 to 80 percent of all system costs, making the movement to green easier to achieve. “Businesses that invest in solar aren’t just investing in a cleaner future--they’re investing in themselves by becoming more sustainable and independent. The energy savings that are involved allow them more opportunities.” says Teague Dickey, CEO of Iconic Energy. Going green allows AME to reduce its carbon footprint and that of the surrounding community, and helps transform Rockford by encouraging other local businesses to join the clean energy movement. “We all have a social responsibility to protect our environment. Clean energy, like solar and wind power, is a step in the right direction,” says Dietmar Goellner, AME President and CEO. Advanced Machine & Engineering® (AME) was founded in 1966 out of Rockford, Illinois (USA) by Willy Goellner. Originally known as Advanced Engineering Co., AME has developed into a global leader in machine tool components and metal cutting machines for over 50 years. With strong core values supporting American manufacturing education, AME’s robust apprenticeship and community outreach programs ensure a secure, innovative environment that supports AME facilities and aides in the development of the American manufacturing movement. Iconic Energy is a solar energy company that has spent years conducting research and development of solar equipment for the commercial, residential and industrial markets to develop high quality and long-lasting solar packages within the industry. Iconic Energy is a licensed electrical contractor in the state of Illinois, and is a dedicated solar energy company. Commonwealth Edison Company, perhaps better known as ComEd, is a unit of Chicago-based Exelon Corporation (NYSE: EXC). Exelon is one of the nation's largest electric utilities, with approximately 5.4 million customers. ComEd provides service to more than 4 million customers across Northern Illinois, or 70 percent of the state's population. ComEd's service territory borders Iroquois County to the south (roughly Interstate 80), the Wisconsin border to the north, the Iowa border to the west and the Indiana border to the east.